Septic tanks are a feature in homes that homeowners and prospective home buyers cringe at the thought of. A home with a septic tank is one that does not rely on municipal sewers, but rather disposes of waste independently. A quarter of the U.S. population uses a septic tank, according to Craig Mains who is the technical assistant at the National Environmental Services Center at West Virginia University. Lighter solids, such as grease and oils, will float to the top of the tank which forms a layer called scum. Heavier solids will fall to the bottom, called sludge, leaving the middle of the tank filled with wastewater. The two layers of sludge and scum sit in the tank and are broken down by the bacteria found in the wastewater. 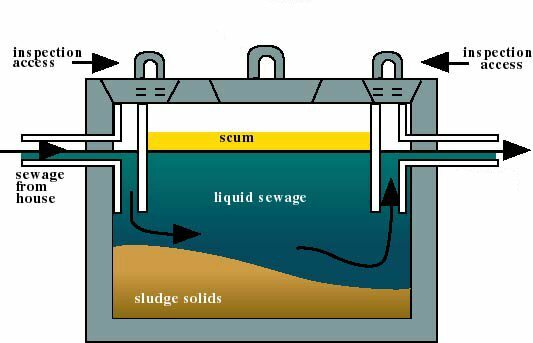 The scum and sludge, that has not been broken down by the wastewater will remain in the tank until it is drained by a professional. From the tank, the wastewater flows through pipes into a drainfield, where the wastewater soaks into the soil. These drainfields are a series of trenches that is one to three feet below the ground. The soil will naturally filter out the contaminants and bacteria will break down any organic material. The amount of waste that is produced by the people who live in the house. The volume of solids that end up in the wastewater. Avoid using concrete or asphalt to cover the drainfield. Grass is the best cover because it helps prevent erosion and will help remove any excess water. To make sure the drainfield is away from any tree roots that may damage it. Another important thing to check is the age of the tank. Although very well-designed septic tanks will last 25 to 30 years, if you do have to replace it, the cost could be up to the tens of thousands.